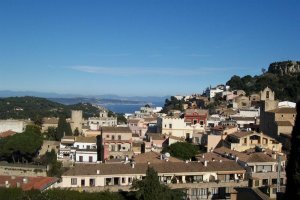 Although it is some way inland from the coast, Begur is the point of convergence of many roads, and a point of departure for some of the most interesting and beautiful parts of the coast. 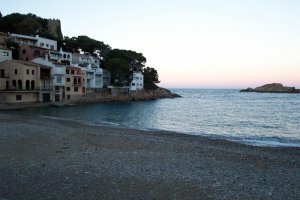 It is about 6 kilometers north of Palafrugell and crowns a steep and high cape that has same name. Its location ensures a view that can be seen clearly over a wide area of the country and it enjoys an extensive panorama of great variety. From the castle built on the rock crowning the town, you can see the coast as far north as the Gulf of Roses and the Medes Isles to the south, the extraordinary Fonda Beach, Fornells , Cap Rubi, Isla Blanca Aiguablava, the Puntas of Es Mut, del Quart and of Sa Rubia, and towards the interior, the spectacular l'Empordd plain. The castle which gives Begur its perfect silhouette was built in the XVII-th century on the ruins of the fortress destroyed in 1465. In the village there are some very old streets remains and some houses called "de piratas" or "de moros" (Moors' houses). Begur is situated on a cape which consists of a huge geological mass with vertical cliffs that drop down into the sea, the only access being via four little coves. The coves have an air of fantasy and melancholy given by the height of the mountain, the thickness of the wooded cover and their narrowness. In the summer the south coves of the Cape of Begur, Fornells and Aiguablava, are a wonderful tourist resort with high-quality hotels and an unforgettable countryside. The beach of Sa Tuna and the deep cove of Aiguafreda, with a little harbor a clean beach are situated in the north. Sa Tuna, offering sheltered anchorage for pleasure and fishing boats, has always been the most visited beach. The sea comes into Sa Tuna through a narrow entrance, forcing its way between rocky islets. The settlement has some fourteenth century ruins. The thick pine woods of the interior make another attractive feature. Still further north, after passing the cove of Aiguafreda, you can see a grandiose construction which has been built on the flank of Cap Sa Sal among the pine trees. This is the biggest hotel on the Costa Brava, the Hotel Cap Sa Sal; from the hotel itself, a series of terraces and swimming pools drop down to the level of the sea. Another beach accessible from Begur is Sa Riera or Sa Riereta, in the south of the cape. Here, the original fishermen's homes are being replaced with modern constructions for the tourists. On the east side, after leaving behind the last beach of the Punta de la Creu, is the immense "Platja de Pals", one of the longest beaches on the Costa Brava among the Gulf of Roses. Facing south-east, forming an open concave curve, its size and the curve's smoothness give it an unusual appeal. The conquerors and settlers of Ibiza Island set out from Pals and the surrounding area, according to legends confirmed by Ramon Muntaner in his "Chronicle". The historians among the peoples of Pals and Begur will tell you many other marine tales.